On November 21st of last year Saul “Canelo” Alvarez earned his second world title in as many weight classes when he scored a twelve round unanimous decision over former multi-division world champion Miguel Cotto to win the WBC Middleweight world championship. Alvarez, who had been one of Boxing’s hottest rising stars for several years in many ways reached the pinnacle of star status by defeating Cotto, one of the sport’s biggest stars for most of the last decade. The win over Cotto also set up an interesting storyline that could possibly culminate in 2016 as Alvarez might be on a collision course with undefeated unified WBA/IBO/IBF Middleweight world champion Gennady Golovkin for a bout that would further unify the Middleweight division. Before a fight with Golovkin can be made however, Alvarez will make the first defense of his WBC world championship on May 7th against former unified Jr. Welterweight world champion Amir Khan at the new T-Mobile Arena in Las Vegas, NV. A bout that will headline a fight card televised in the United States by HBO Pay-Per-View. Although Alvarez’ 160lb. Middleweight world championship will be at stake, the bout will be fought at a catch weight of 155lbs., one pound above the Jr. Middleweight limit of 154lbs. The selection of Khan as the opponent could be considered an odd choice in the eyes of some. Khan, who will enter the fight with a record of 31-3, with 19 Knockouts has never fought at a weight limit higher than the 147lb. Welterweight division and will be technically challenging for a world championship of a weight class twenty pounds above the 140lb. Jr. Welterweight limit where he last held a world championship. Khan however, will enter this fight having won his last five bouts including his last fight, a twelve round unanimous decision over former WBO Welterweight world champion Chris Algieri in May of last year. Khan has seen his career hit somewhat of a limbo period after failing to secure a lucrative opportunity against either Floyd Mayweather and Manny Pacquiao in the last year. Khan’s desire to face a marquee star of the sport now leads him to a bout against Alvarez. Although Alvarez, who will enter the fight with a record of 46-1-1, with 32 Knockouts will likely be viewed as the favorite against Khan, the challenger has a style that utilizes a mix of hand speed, punching power, and lateral movement. The question heading into this fight will likely be whether or not Khan’s speed and power will the same at the higher weight limit. It sets up a scenario where one might argue it is high risk/high reward for Khan, a fighter who has been passed over as a potential opponent by marquee stars of the sport, and a high risk/low reward scenario for the champion Alvarez who may very well have a lucrative fight ahead of him in the form of Gennady Golovkin. Should Khan pull off what most would consider an upset it would finally give him the kind of recognition and boost in terms of his standing in the sport that he has sought for years against a marquee opponent. 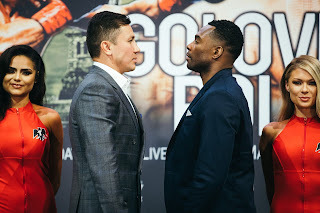 The danger however, for the champion will be should he lose this fight against a fighter he will likely be favored to defeat, a potential lucrative payday against Gennady Golovkin, one of the hottest rising stars in the sport and one might argue the number one fighter in the Middleweight division could be out the window. A loss for Khan in this fight could possibly put his career at the top level the sport in jeopardy after suffering some setbacks throughout his career. It is an intriguing match-up between two fighters with much to lose and much to gain. A fight that should generate the interest of Boxing fans.